​1. Adopts PID programmable temperature control technology with an implantable highest-precision PID program for high-speed tracking and detection of actual soldering station temperatures with real-time temperature correction. Temperature stability, minimal temperature error. 2. With suction tin soldering station and soldering iron function which can intelligent identify and interchange When we need to use the soldering iron remove the suction tin soldering handle ,connected the iron handle It can intelligent identify and read the last time temperature setting parameter of soldering iron .if need to change back to the suction tin soldering station take down the iron handle and connected to suction tin soldering handle ,the machine automatically identify suction tin soldering handle temperature parameters. 3. Anti-static design prevents electrostatic component damage or leakage. 4. 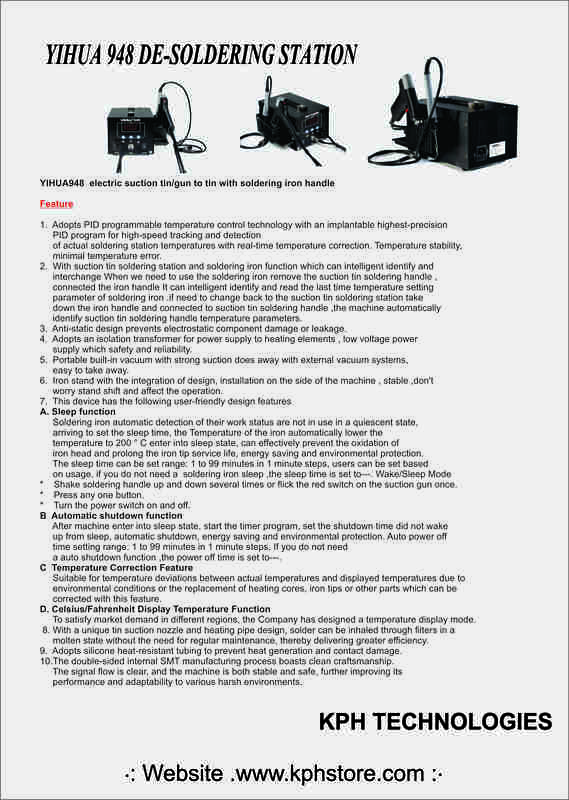 Adopts an isolation transformer for power supply to heating elements , low voltage power supply which safety and reliability. 5. Portable built-in vacuum with strong suction does away with external vacuum systems, easy to take away. 6. Iron stand with the integration of design, installation on the side of the machine , stable ,don't worry stand shift and affect the operation. 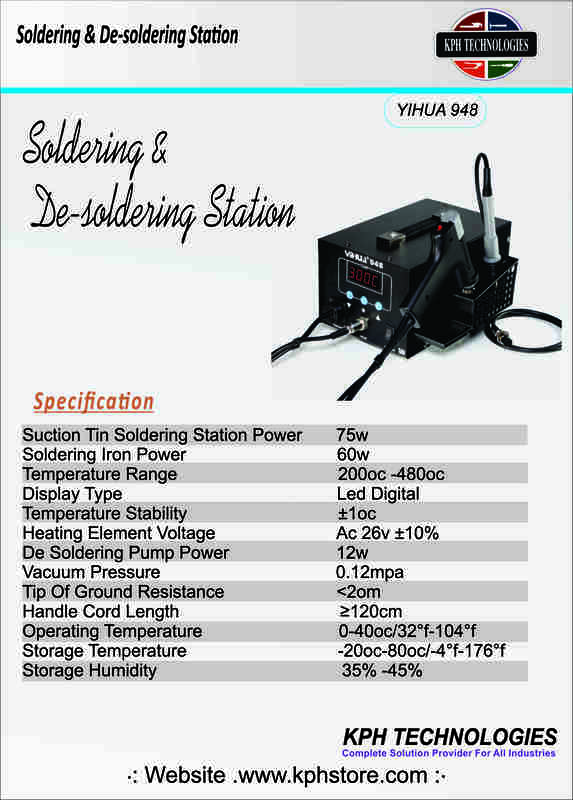 Soldering iron automatic detection of their work status are not in use in a quiescent state, arriving to set the sleep time, the temperature of the iron automatically lower the temperature to 200 ° C enter into sleep state, can effectively prevent the oxidation of iron head and prolong the iron tip service life, energy saving and environmental protection. The sleep time can be set range: 1 to 99 minutes in 1 minute steps, users can be set based on usage, if you do not need a soldering iron sleep ,the sleep time is set to---. a Shake soldering handle up and down several times or flick the red switch on the suction gun once. b Press any one button. c Turn the power switch on and off. After machine enter into sleep state, start the timer program, set the shutdown time did not wake up from sleep, automatic shutdown, energy saving and environmental protection. Auto power off time setting range: 1 to 99 minutes in 1 minute steps, If you do not need a auto shutdown function ,the power off time is set to---. Suitable for temperature deviations between actual temperatures and displayed temperatures due to environmental conditions or the replacement of heating cores, iron tips or other parts which can be corrected with this feature. To satisfy market demand in different regions, the Company has designed a temperature display mode. 8. With a unique tin suction nozzle and heating pipe design, solder can be inhaled through filters in a molten state without the need for regular maintenance, thereby delivering greater efficiency. 9. Adopts silicone heat-resistant tubing to prevent heat generation and contact damage. 10. The double-sided internal SMT manufacturing process boasts clean craftsmanship. The signal flow is clear, and the machine is both stable and safe, further improving its performance and adaptability to various harsh environments.